If Lean focuses on driving out wasteful activities, and enhancing those that add value to the customer, 6 Sigma (or Six Sigma) works alongside by delivering robust, stable and predictable processes that enable further Lean improvements. Motorola is credited with establishing 6 Sigma in the late 1980’s as a response to slumping market share as Japanese companies triumphed by producing high quality, reliable electronic items. To stay in business they had to re-think totally their attitude to quality. Their 6 Sigma programme started as a simple tracker of actual performance against customer requirements – the goal being to get from percentage levels of defects down to just a few defects per million. However the difference between this and yet another reporting metric was the drive and determination to meet it. This in turn helped generate a body of tools around the core, notably the DMAIC model for Change: Define your goal, Measure the current condition, Analyse that condition, propose alternatives and choose the best, test it in the Improvement phase, then apply it full scale and Control the new system to sustain the gains. Motorola, then General Electric, and many other firms, seized the opportunities and saw spectacular improvements in their performances. For example Motorola claimed to have saved $14 Billion in ten years from 1987. (Peter Pande, The Lean Sigma Way). Several other companies have reported similar transformations. One of the most important characteristics of 6 Sigma is the importance it places on data. Having meaningful data, and using a variety of tools on it such as Regression Analysis, Root Cause Analysis (RCA), Measurement Systems Analysis (MSA) and enables truths about the system to be recognised. The system can then have errors and variability reduced. As control improves the system performance can then be optimised through Design of Experiments (DOE). A further tool is fundamental, and this is Quality Function Deployment (QFD). QFD enables the customer’s basic requirements to be cascaded through the supplier’s design process, even to the extent of defining control settings on production equipment. There is much more to 6 Sigma of course but the combination of it and Lean is truly powerful. Why is it called 6 Sigma? If the variability in your process meets a couple of simple statistical criteria, the variability can be measured as the Standard Deviation or the Greek symbol sigma. Normal process variability means that a few results may be particularly low or high. If these results are outside the Specification Limits they will fail. The less variability in the process, the less likely they are to be outside the Limits. 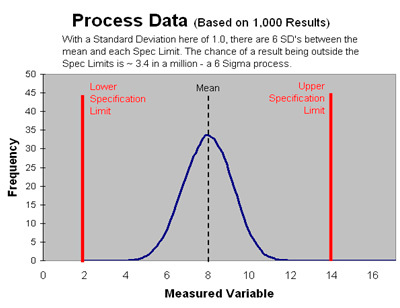 6 Sigma is named because if there are 6 standard deviations between the process mean and the Customer specification limits, then the chance of having an item outside those limits is only about 3.4 in a million. Why bother about aiming for these vanishingly small targets? Well if aircraft landings were only 99% right then there would be at least 2 crashes per day at London’s airports. Or at home your electricity supply could be off for for 15 minutes per day. Obviously some companies and processes can achieve 6 Sigma performance. It is well worth striving for.